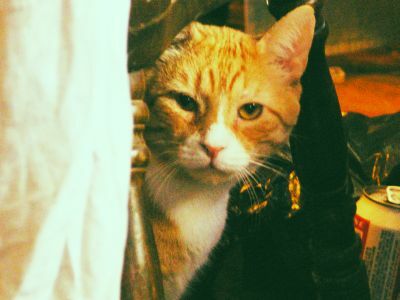 My Cat Abraham Lincoln (Ftrain.com) . I rename my cat every month; this month his name is Abraham Lincoln. He talks to me for hours at a time, and when I do not give him the love he deserves he enters the bathroom, finds a spot in the bathtub that resonates perfectly, and screams until I give in and call for him. Then he trots over and waits to have his ears scratched. In this manner he is fully actualized. He has a dread disease, FIV, which slowly kills him. The other day he turned to me as I worked and said “mrgnao”; then he vomited fully and without reserve into the pair of pants I'd left on the floor. I picked him up and soothed him, and said his name (for the month), and when he began to purr I put him down and cleaned off the sullied pants, sighing. I am fully responsible for his entire digestive process. His food comes in white plastic Science Diet bags, runs through his intestines, and goes out in other white plastic bags, smelling of pine. He is a noisy purrer and a drooler. In the mornings, when I am not worth a damn, he jumps onto my chest, digs his claws into my flesh, purrs, and sometimes drools directly into my mouth. Also, he is not the best groomer (I'm not either), and sometimes, bloody snot accumulates around his eyes. Every few months I need to bathe him. He fights weakly as the water rushes over him, then sits still, silent and hunched, as I shampoo his back and face. When it's over he hides in the closet and grumbles for hours. He is not totally without a sense of adventure. He'll scale an Everest of boxes to hide inside one of them. He'll stand whining at the edge of the shower with his eyes huge. And he killed a two-inch-long cockroach that flew into the apartment and landed on my neck; he killed it without fear while I sat on the bed trying not to get depressed over the cockroach. If a mouse was stupid enough to show its gray whiskered face in this apartment it would be swiftly destroyed in his jaws. Or stupefied by his breath. One says of ones cat: my cat is the best; he is not like all the other cats; he has a personality. I do not say these things about Abraham Lincoln. And yet he fills out my life. He is orange, and confused, and becomes furious whenever I answer the phone. He yells and hops around, amazed that I could even consider talking on the phone given how badly he suffers when I do so. He covers everything with hair, even aluminum cans. He has poked his head into a small brown paper bag, gotten it stuck, and run across the room like a brain-damaged unicorn, smashing into chair legs and trash cans. I just watched, in paradise, until finally he sat on his haunches with his head still encased in the bag, waiting for fate to deliver him, or kill him—he'd made his peace. I am grateful that I can pull the bag off of his head. It's simple enough but it means the world to him. This is My Cat Abraham Lincoln, an essay by Paul Ford and Paul Ford, published Tuesday, February 22, 2005. It is part of Walking/Riding, which is part of Semiautobiography, which is part of Story, which is part of Ftrain.com.